Although caravans are a comfortable way to tour, with good camping trailer you can literally go anywhere (I am not referring to a ‘camper trailer‘ here. 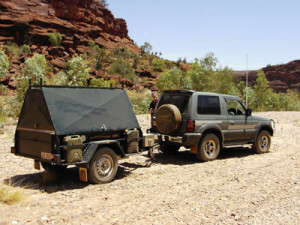 Initially, I thought about buying a manufactured off-road, u-beaut, ready to go camping trailer. However, anything that was decent and suitable for the trips I wanted to do was going to cost an arm and a leg. As a result I looked around and purchased a solid trailer and built in my own storage and kitchen. The first trip I did with the trailer was along the Old Andado Track on the edge of the Simpson Desert. My father towed a older style pop-up caravan and we spent a week or so exploring a beautiful part of Australia. At this stage the trailer didn’t have a canopy, just the bare trailer and I wanted to see how it handled before doing any more to it. The trailer tracked well, and was fantastic on the deeply corrugated Andado Track. At the end of this trip I decided that the trailer was certainly worth fitting out into a real camping trailer. The short wheeled based Pajero you see in the pictures has a 2.4 litre turbo charged diesel, not underpowered but overall it is on the small side. For this reason, I opted to have a canopy built that wasn’t square, more along the lines of a trade canopy. 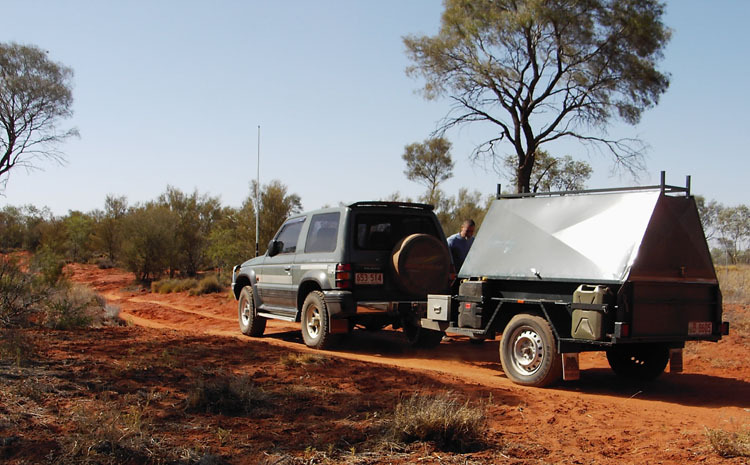 This shape means the camping trailer has less wind resistance as it follows the shape of the vehicle, and also provides plenty of room inside. There is even space to put my small generator! Once I fitted the canopy it was onto the fun of fitting it out and making it into a real camping trailer. Firstly, a 60 litre water tank (cased inside 3mm galvanised skin) was slung forward of the axle, with a 12v pressure pump inside the trailer, and tap outlet at the rear of the canopy. Nothing like having running water… although you need to educate people to use it sparingly. In addition to the 60L another 40L of water is carried in two external jerry cans, giving a total of 100 litres, enough for a couple of weeks if used sensibly. I then built a roll out cupboard to hold all foodstuffs, pots n pans, cutlery and any other imaginable item that my wife wished to carry. Finally, and after months in the shed, I had full slide out rear kitchen, complete with sink and four burner gas stove. (some would say a kitchen really is overkill and something like a woodgas stove would be far better:) The trip through the Finke Gorge National Park (NT) to Boggy Hole was the first trip with this fit out. By the way, Finke Gorge National Park trip guidelines suggest trailers should be left behind and unless you are extremely experienced, and by that I mean in excess of 10 years hard four wheel driving, then you should not take a trailer. Basically the track follows the river, (interesting to watch our progression on the GPS) and in places it is very deep fine sand. This means you can become hopelessly bogged unless you know what you are doing. The trip was undertaken in January and temps were regularly over 40°C. In these temperatures fine sand is treacherously soft, but correct tyre pressures and application of good driving skills made the trip an enjoyable experience. Nevertheless, after the trip I did change over to wider rims and tyres on the camping trailer. 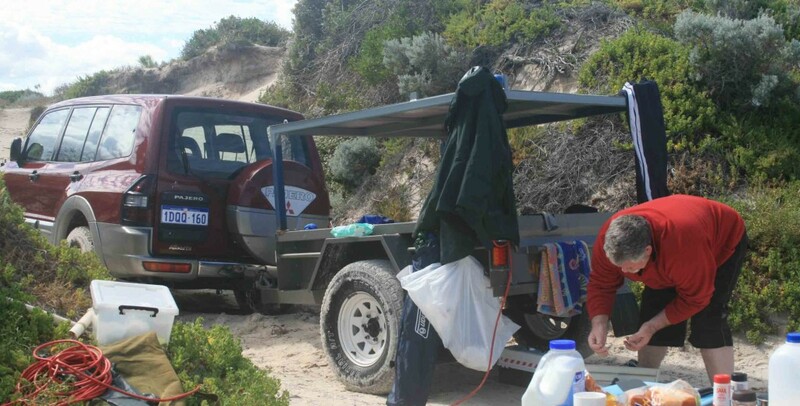 Apart from being interchangeable with the vehicle, the larger footprint meant easier towing in soft sand. One final addition was the Howling Moon rooftop tent. 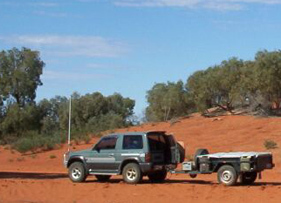 It is always a pleasure to go bush with a camping trailer and this one formed the support hub for the Uluru National Park riders in the 2004 Finke Desert Race. 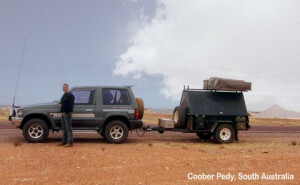 On moving to Canberra the camping trailer had very little use and I sold it. In hindsight it wasn’t the best decision as five years later I found myself back in Western Australia living in Perth. So I purchased a new solid but small box trailer and bult a frame to carry the 12 foot dinghy. The old short wheel base Pajero above was getting pretty tired and so a larger and later model Pajero became the replacement. Tons of room and great to get down on the beach.